Human Rights Watch today issued a press release to tie in with World AIDS Day – the theme of which is "universal access and human rights" – which highlights that punitive laws, including those that criminalise HIV transmission, threaten progress towards both of these important goals. "HIV prevention has failed in many countries not because we don't know how to design effective prevention programs, but because governments have been unwilling to implement these programs and ensure that they reach everyone," Amon said. 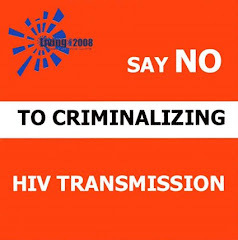 "The potential of HIV treatment in comprehensive prevention programs will be similarly sabotaged if governments continue to pass punitive laws and trample upon human rights.